Evolution Host SSD and HDD Starter Packs on sale now! Mike from Evolution Host just sent in an offer for 50% off their VPS plans and we’re happy to bring the offer to you. They’ve got 7 locations, two of which are new (Dallas and Nuremberg). 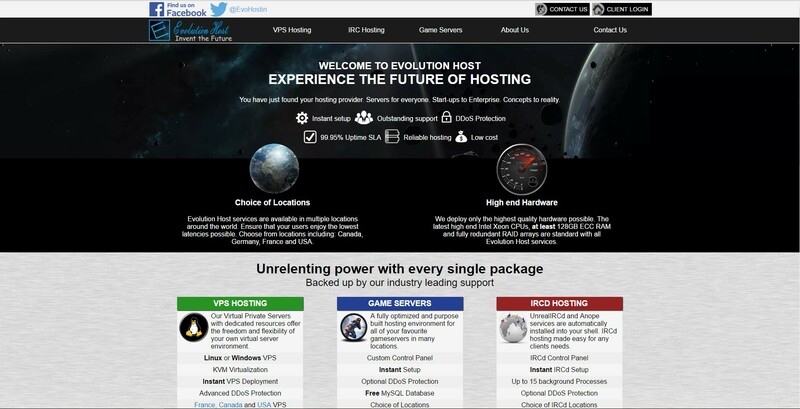 “Evolution Host has been in existence since 2012 and openly trading in hosting solutions since 2013. (Formerly evolutionhost.co.uk). We strive for innovation and expansion by utilizing the latest technologies available and trying to reach as many locations as we can to provide our clients the best experience possible. Our support team is the core of our business, it is our goal to ensure every client is more than satisfied with their Evolution Host experience. They accept PayPal and Bitcoin as payment, their WHOIS is public, and you can find their legal doc here. Why not just get 1-2Gb RAM with unlimited transfer for cost of 512 Mb with 1Tb? For quality hosting no support needed. One-time. The invoice for next month was full price for me. why I can not make order . show payment way processing ? How to use the coupon? Didn’t see any input for coupon. I would like to try “Starter SSD Package” in Chicago location. Nvm. But 30BOX couple sets the price to $3.5/m instead of $2.5/m. So far lots of problems with this host. Connection timeouts regularly (using Montreal Data Center). webmin installed via their wizard timesout regularly. and no response from technical support so far (online chat is down, and email chat is unresponsive).